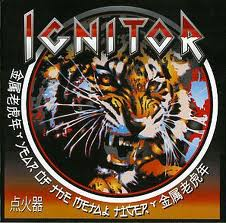 IGNITOR play Heavy Metal…Word. And they do it well. Fronted by Jason McMaster (DANGEROUS TOYS, WATCHTOWER) IGNITOR subscribes to the JUDAS PRIEST school of Metal delivering their goods in 7 songs that stop shy of being down right infections. Because this is so well done I am having a hard time pinpointing exactly what might be holding them back from just ripping my face clean off my skull. The music is full-speed-ahead heavy metal that rarely veers into any sort of sub-genre, just straight up molten metal. The guitars rip through the air like precision lasers trained on your fricken’ ear drums. A solid rhythm section lays down the ground fire clearing the path for metal. The drumming stays behind the beat for the most part, darting out here and there only to take cover again. This tactic is very successful and keeps things from getting too busy. I guess that leaves the vocals. When McMaster tries to do his best Halford imitation it only seems to work in small amounts. On some songs he tries to keep this high pitched screech up for the whole jam. The problem might be that he just doesn’t have the pipes for it anymore and sounds sort of blown out and strained. What made JUDAS PRIEST so great is where many bands suffer. Even on their most pile driving metal assaults they always managed to work in a pop hook that keeps every song interesting, memorable and different from the last song. This is, again like many other bands, is something that IGNITOR is not able to quite pull off. That’s why PRIEST is able to write and infectious song while most others just can’t get it to click. The lyrics follow the MAIDEN school of being somewhat educational as they topple somewhat historic times and events with songs like ‘Shadow of the Needle’ and ‘The Kaiser’. That’s not to say though that they don’t know how to have fun. The song ‘Heavy Metal Holocaust’ starts off with the line “Ozzy Osbourne sold his soul to the Devil” and goes on to tell a story of Heavy Metal triumph that would make Jack Black proud. ~ by thrashpunx on April 27, 2012.